We are now located in San Jose Del Cabo,(23.02.841N x 109.38.512 W) just a few miles east and north of famous Cabo San Lucas Mexico. Comfortably in a slip at Puerto San Jose Del Cabo, it is our first opportunity for internet access other than via satellite phone which is very expensive and painfully slow. It is the longest I have gone without internet I can remember, perhaps the longest since I first logged on to “Compuserve” many, many years ago. Wonder how many remember the dialup days BEFORE AOL? The next entries will tell of our trip south to San Jose Del Cabo. We began our trip south from Ensenada (31.84N x 116.62W) to the first stop, Turtle Bay (27.67N x 114.88W), 280 nm south by south east. The longest leg of our trip we, scheduled it for 38 hours run time @ 7.5 kts. Departing at 10:02pm on Friday evening running 3 hours shifts of one person on watch and one “in the watch berth” in the pilot house, the trip was uneventful for WORKNOT. Thirty three boats left Ensenada and one turned back within a few hours. For the boats folks, a Nordlund 68’ switched to an empty fuel tank and promptly stalled both engines. Unable to restart, a tow was arranged from Ensenada. The rescue boat was expected to take 4 hours to reach them, when it did the captain of the rescue boat was able to restart the engines but they choose to turn back and exit the FUBAR. This was one of the larger boats, professionally crewed and it was a surprise to see them out at the beginning of the first leg. Fortunately the seas were very calm but 4 hours abeam, in the dark, could not have been fun. We arrived in Turtle Bay at 1:20pm on Sunday. On the way we fished and actually caught several yellow tail tuna worthy of cleaning. Kagi, a friend who set me up with fishing equipment and tried to teach me would have been proud. Our normally clean and shiny aft deck was turned into a blood bath as Dave and I landed 12- 20 pound tuna, cleaned tuna, caught more fish and continued the cycle until we quit fishing. A larger cooler will be required if this is to continue. Gaff skills improved with each catch but nothing like the skill demonstrated by Kagi. Fuel burn was 170 gallons - 4.4 gallons/hr. Several boats required fuel at Turtle bay. An interesting negotiation with the single source provider who controls the only fuel dock available. Glad we did not need to approach it other than by panga. It’s an old cannery pier, very frightening steps to the water and many missing planks etc. Although fuel prices, panga ferry service, dinner etc. had been pre-arranged it quickly broke down to “price at time of service” for support. Got a perfect glimpse of our host as he was sitting in a new, clean, Chevy quad 4 x4, counting a wad of Pesos while directing his “crew” supplying fuel, ice, panga ferry service and support of the fleet. The gold rimmed glasses and the quick smile made me feel more NY city than Mexico but he was there to support a captive market and all went well. More when we have some time to rest. 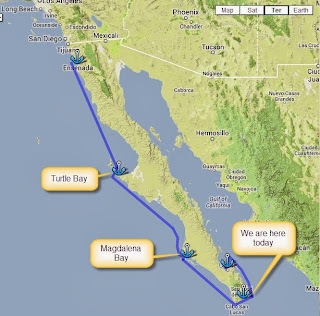 Next report Turtle Bay to Magdalena Bay (24.651N x 112.12 W) and then San Jose Del Cabo and finally La Paz.